November 13, 2016 at 7:32 pm. Saturday was supposed to be the calm before the chaos. It was the chaos. No. 2 Clemson, No. 3 Michigan and No. 4 Washington all lost — as did No. 8 Texas A&M and No. 9 Auburn. Clemson and Michigan had been favored by about three touchdowns. Each of the five upset victims had been favored by at least two scores. –Winner: Ohio State. The Buckeyes should rise from No. 5 to No. 2 in what will be very interesting rankings from the College Football Playoff selection committee on Tuesday. Ohio State has posted back-to-back wins of 62-3 over Nebraska and Maryland since losing to Penn State. –Loser: Ohio State. Speaking of that loss to Penn State, the Buckeyes don’t control their destiny in the Big Ten East. 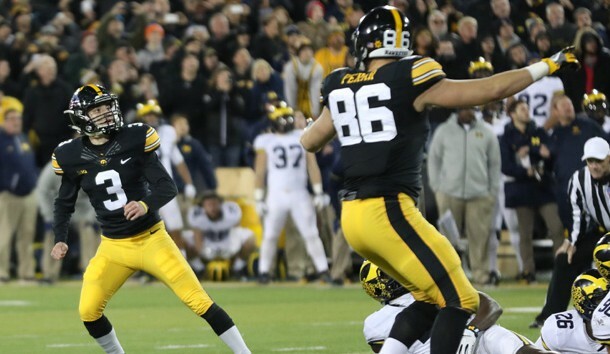 Michigan’s loss at Iowa means the head-to-head tiebreaker scenarios change. Any Ohio State chance of winning the East now requires Penn State to lose at Rutgers (ha!) or at home to a Michigan State team that has nosedived in 2016. –Muddy: If Penn State wins the Big Ten East — this presumes an Ohio State victory over Michigan to help make that happen — does a two-loss Big Ten champ make the playoff over the one-loss Buckeyes? Do both get in? –Winner: Louisville. If a one-loss, non-championship team makes the playoff, it might very well be the Cardinals, whose only loss was by a few yards at Clemson. We want Lamar Jackson in that playoff; we need Lamar Jackson in that playoff. –Muddy: The ACC. Clemson could have clinched the ACC Atlantic, and Virginia Tech could have nailed down the Coastal. Both lost. –Winner: Washington State. The Cougars easily beat Cal for their eighth consecutive victory after an 0-2 start. Loser: Washington State — Needing as much playoff cred as possible, the Cougars no longer can be the first team to beat Washington. The Huskies went down to USC, but that didn’t really change the math in the Pac-12 North. The Apple Cup winner in Pullman in two weeks will advance to the conference title game. –Muddy: Washington. The strength-of-schedule-challenged Huskies can finish 12-1 with wins over Arizona State, Washington State and the Pac-12 South champ, but will that be enough? The Huskies’ best hope is to get a rematch with USC in the conference title game. –Winner: Oklahoma. The two-loss Sooners end the regular season vs. two ranked teams — at West Virginia and home for Oklahoma State. They have a chance to put a whopper of a topper on an undefeated run through the Big 12 and stake out playoff position. –Winner: Wisconsin. The Badgers have a good resume (wins over LSU, Nebraska, at Iowa), control their destiny in the Big Ten West and would also have a strong playoff case as a two-loss conference champ. It’s complicated, when everything was so clear before Saturday. 1. Ole Miss has its quarterback of the future. True freshman Shea Patterson broke out of a redshirt year in the wake of Chad Kelly’s season-ending knee injury, and the five-star prospect did not disappoint. Patterson led the Rebels to 23 fourth-quarter points in a 29-28 upset at Texas A&M, as he completed 25 of 42 passes for 338 yards, with two touchdowns and one interception, also showing Manziel-like scrambling skills. 2. Derrius Guice is the best backup RB in the country. The LSU sophomore, an understudy to junior Leonard Fournette, rushed 21 times for 252 yards, including a show-stopping 96-yard touchdown run that is the longest scrimmage play in school history. The Tigers bounced back just fine after being shut out by Alabama, winning 38-10 at Arkansas. 3. USC’s Sam Darnold is the best freshman quarterback in the nation. Considering redshirt freshmen and true freshmen, here is how we rank them: 1. Darnold; 2. Alabama’s Jalen Hurts. 3. Texas’ Shane Buechele. 4. Florida State’s Deondre Francois; 5. Duke’s Daniel Jones. 4. Western Michigan keeps rowing. The 10-0 Broncos slogged through a 37-21 Election Night victory at Kent State and then watched a bunch of undefeated teams fall on Saturday. Only Western Michigan and Alabama remain perfect. The Broncos are on pace to reach the Cotton Bowl, but a Nov. 25 home game against Toledo is a high hurdle. 5. Christian McCaffrey is still Christian McCaffrey. Because of injury, a lack of a supporting quarterback and Stanford’s fall from the national discussion, McCaffrey won’t match his Heisman runner-up status from a year ago. But he has 503 rushing yards and six touchdowns in the past three games, all victories, and he’ll go wild against two of the worst four defensive teams in college football — Cal and Rice — to close the regular season. 112 — The winning streak of Division III power Mount Union that was snapped Saturday night when John Carroll threw a touchdown pass with 39 seconds left for a 31-28 victory. Mount Union hadn’t lost since Oct. 22, 2005. 22 — Alabama’s winning streak, the longest current run in the FBS. The second-best streak is only eight, held by … Washington State. 185-0 — Combined score for Rutgers in games this season against Michigan, Ohio State and Michigan State. Thanks for playing? 6 — Pac-12 victories by Colorado in seven games this season. That’s one more conference win than the Buffaloes had in their first five SEASONS in the league. 1 — Alabama quarterbacks who have thrown for 300 yards and rushed for 100 yards in the same game. Jalen Hurts did it Saturday against Mississippi State. 1. QB Lamar Jackson, Louisville. He set the ACC record for rushing yards by a quarterback in a season (1,334), set a school record for total offense (4,232) and expanded what is likely an already historic lead over the rest of the Heisman field. 2. RB D’Onta Foreman, Texas. He leads the nation with 179.2 rushing yards per game, a powerful runner who is going to get his yards no matter what. It’s not his fault Texas is just 5-5. 3. QB Sam Darnold, USC. Why not? He outdueled Washington’s Jake Browning on Saturday as the Trojans won their sixth straight game. The insertion of Darnold into the starting lineup in the fourth game of the season is the most impactful quarterback switch of the college season. 4. QB Jalen Hurts, Alabama. Being the quarterback for the nation’s top-ranked team is a near guarantee for an invite, and the freshman just keeps getting better — uncommonly poised, a great runner and getting better all the time through the air. 5. RB Donnel Pumphrey, San Diego State. The senior is up to 6,051 career rushing yards, fourth on the FBS list, and needs 347 more to eclipse Ron Dayne’s record. 1. Washington State at Colorado (Saturday, 3:30 p.m. ET) — The next time someone says they can predict college football, remind them that this late-season game is a battle of Pac-12 division leaders. Total number of people who saw that coming: Zero. 2. Oklahoma at West Virginia (Saturday, 8 p.m. ET) — Two of the three teams that can still win the Big 12; Oklahoma State is the other. The stock of Mountaineers’ coach Dana Holgorsen could go through the roof with a win. Hello, LSU? Oregon? 3. USC at UCLA (Saturday, 10:30 p.m. ET) — The Trojans have to hope for a Colorado loss to win the Pac-12 South, but they first need to take care of business in their final conference game in this crosstown rivalry. 4. Florida at LSU (Saturday, 1 p.m. ET) — The Florida home game was rescheduled as an away game after a postponement caused by Hurricane Matthew. The Gators can clinch the SEC East with a win (Tennessee is still alive). 5. Louisville at Houston (Thursday, 8 p.m. ET) — The Cardinals won’t get the strength-of-schedule boost they were hoping for as the Cougars have slumped, but plenty of style points will be up for grabs as everyone watches to see what Lamar Jackson does next.